Yesterday marked the 50th anniversary of the signing of the Universal Declaration of Human Rights. For such an auspicious occasion it would have been appropriate to feature an individual who has championed the cause of human rights protection in Ethiopia. This someone should have shown steadfast commitment to the principles laid out in the Declaration, and made pursuing the respect and protection of these universally proclaimed rights for the Ethiopian people their life's work. Unfortunately I do not know of such a person, and the few individuals who come close to what I was looking for refused my request for an interview preferring instead to maintain a low profile. Such are the times we live in. Of course I am receptive to suggestions should you know of someone who fits the above mentioned criteria. So instead we feature children. Children represent that segment of society that has the most to gain from the implementation of the Declaration and subsequent related conventions and treatises on the rights of human beings; their productive lives lay ahead of them. They also have the most to lose should these rights be denied them. Unlike older members of society, children are the least likely to command access to legal and political support. Hence they lack the means of voicing their concerns and lack the ability to mobilize to affect positive change. The most prominent commemoration of the anniversary in Addis Ababa was organized under the auspices of the UNESCO Office in Ethiopia. The highlight of these commemoration activities were the works of children: the paintings on the theme of human rights by students from 34 schools, the murals painted on Bole Road by street children, and the street performances and parade led by the much acclaimed group Circus Ethiopia. The combined efforts of these children resulted in a lively and memorable commemoration of the Universal Declaration of Human Rights. Through these children it was assured that the important day did not pass by unnoticed by the general public. The street parade and mural unveiling on Thursday morning brought traffic to a standstill on Bole Road. The antics of the Circus Ethiopia performers drew a significant crowd and brought attention to the celebration all along the parade route. The mural on Bole Road not only enhances the appearance of the city but it also serves as a permanent reminder of the existence of that most important document that, through its signing and ratification by the government of Ethiopia, establishes legal guarantees of basic rights and dignity for all Ethiopians. We commend these children for sharing their vision with us all. The efforts of the organizers also deserve applauding. They have provided these children with the opportunity to participate in these celebrations. 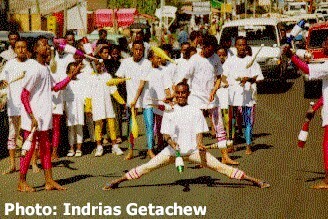 In the few years of their existence the Circus Ethiopia troupe has attained international recognition. Their story is one of phenomenal triumph over conditions of poverty and disillusionment. They have served as delightful ambassadors for their country in major cities of the world where they have performed. They are also an inspiration to all the children who have heard of their success, from street child to respected performer and celebrity. Along the parade route commemorating the Declaration all the onlookers, particularly the street children, cried out in delight when they realized who was coming down the road, "look its Circus Ethiopia - there's the guy on the one wheel bicycle ... etc...."